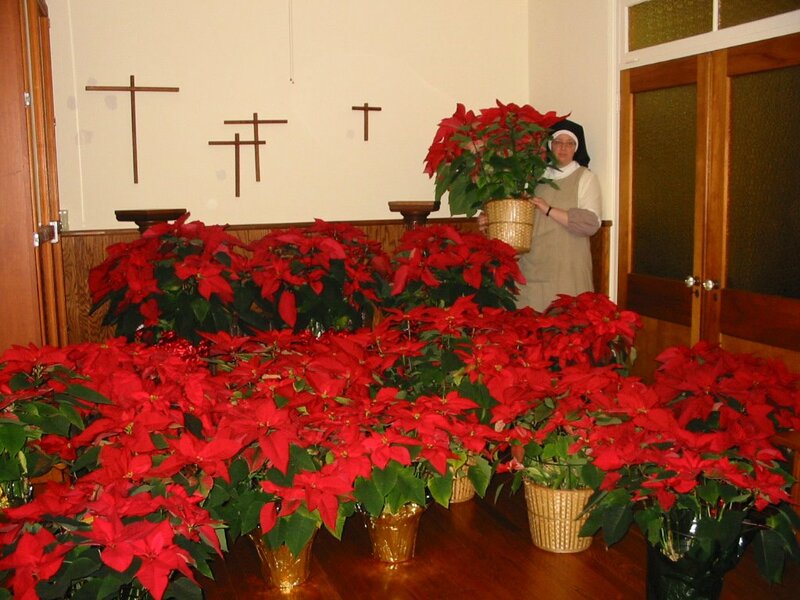 Sister Judith Miryam is surrounded by Pointsettas. We're sure more than a few of you have been stopping by and wondering, "Why aren't the sisters putting up any photos?" The first reason is because we don't really have any! The photographers were too busy "decking the halls with holly and pointsettas, answering the doorbells and phones and practicing Christmas music (ah, Sister, those castanets?) to take many pictures! 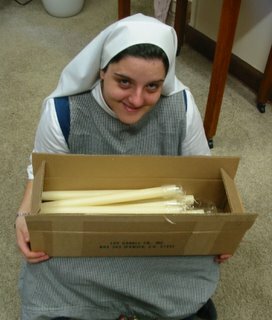 Sr. Greta has the impish look on her face! We had a beautiful celebration of Christmas! The silence of Christmas Eve night was broken by the chanting of Matins. It was Sr. Denise Marie's turn to chant the 1st Reading from Isaiah and it was hauntingly beautiful. Then we had 15 minutes of Christmas carols followed by Midnight Mass. This year we had Fr. Jonathan Kalish, OP as our guest and he concelebrated holy Mass with our chaplain Fr. Kieran. Following Mass and a period of Thanksgiving we had a quiet guadeamus in the refectory. Cheese and crackers, cookies and hot chocolate were waiting for the famished nuns in the kitchen. After a whispered, "Merry Christmas!" in the many languages of our sisters' ethnical heritages with plenty of hugs and kisses to go around, we enjoyed eating our snack in the candlelight refectory listening to Christmas music. For some, it was off to bed ASAP! While for others it meant a quick bite before relieving the sister at her hour of Adoration with Jesus. Frankly, no one gets much sleep on Christmas night even with the VERY LATE rising hour of 6:05AM! (Not 6AM--6:05, thank-you!) The early morning hours are filled with prayer, our minds and hearts caught up into the joy of the liturgy. "Shepherd, tell us, what have you seen? Who has appeared on earth?" we sing with joyful anticipation! At recreation that evening we opened the many gifts given to us by our family and friends. Like in just about any family it's a pretty chaotic event, slightly complicated by the fact that 15 people want to see everything as it's being opened! Then there's the, "Oh, Sister, PLEASE, open that carefully. Save the ribbon. Save the paper!" Or, "Can I read this book? I promise, I'll return it quickly!" Or even, "Sister, don't sit there, that is chocolate!" You get the idea! Fortunately, the bell for Compline rings and with grateful hearts we say good night to the Christ Child asking the blessing of the Queen of Heaven. The rest of this week has been quiet. Almost back to normal. ALMOST. The novitiate hosted it's traditional "Open House" on Holy Innocents Day for the professed Sisters. Tomorrow, December 31st, will be a day of retreat and penance as we thank God for all His blessings and graces on us and the whole world and ask His mercy and forgiveness for all our sins and failings. Lord, have mercy on us!